Seth Seleski was a golden boy during his high school years in Thunder Point, Oregon—good-looking, popular, and the kind of football player whose talent earned him a college scholarship. A single year with the Ducks was good enough to win him Heisman Trophy consideration and a contract with an NFL team. But one year into his contract with the Seahawks, an automobile accident, due in part to Seth’s driving too fast, ended his NFL career and changed another man’s life forever as well. Now thirty-four, Seth has returned to Thunder Point, not as the hero of headlines in the sports section but as the deputy sheriff taking over as substation supervisor from Mac McCain, who has been promoted to a job at county headquarters. Seth also hopes to improve his relationship with his grumpy father, who can’t forgive Seth for throwing away a chance at a pro career, and to renew his friendship with Iris McKinley, who was his closest friend until their senior year in high school. Iris McKinley was not one of the cool kids in high school but rather an outsider. However, since she had her best friend Seth Seleski to share her life, things never seemed too bad. Next-door neighbors, Iris and Seth grew up together, always there for one another despite the fact that Seth was Mr. Everything and Iris was a looker-on. Then their senior year in high school, Seth did the unforgivable and proved Iris could not count on him after all. That marked the end of the relationship they had known. Sixteen years later, Iris is a counselor at the high school she once attended, committed to helping kids like the one she was who are struggling to find a place for themselves. But although Iris has a great heart, she also has a long memory. She still has not forgiven Seth, and the last thing she wants is a grown-up Seth constantly invading her life, trying to persuade her that their friendship can be restored. Robyn Carr returns with the sixth installment of her Thunder Point series, another novel with rich context, engaging characters, and a focus on a contemporary issue. Reunited lovers and friends-to-lovers are two of my favorite tropes, and Carr successfully combines the two in this appealing story. A mature Seth harbors regrets about the self-centered actions of his younger self and sincerely works at making amends. His relationship with the other man injured in the accident that ended Seth’s football career was one of the book’s highlights for me. Iris is an immensely likeable heroine, and watching Seth win her over despite her determination to hold on to her justifiable anger is amusing and touching. Carr does her usual stellar job of weaving other threads into the romance. Seth’s difficulties with his father complicate his story, and Carr again targets an issue that will resonate with her readers. This time the issue is the cycle of domestic abuse and its effects on individuals and the community. Fans of the series will appreciate the appearance of familiar characters, but new readers will have no difficulty reading The Homecoming as a standalone. Robyn Carr is the queen of small-town romance fiction. She is one of the few authors I know who can sustain a series over an extensive run. Her Virgin River series ran for eighteen novels and two novellas, and I was an eager reader through the end. She seems likely to repeat her success with Thunder Point. The sixth installment is a welcome addition to the series. If you like small-town settings and a central romance with added interest, I recommend The Homecoming. Are you reading Robyn Carr? What's your favorite Robyn Carr book or series? Do you enjoy a second chance romance? Friends to lovers stories? Tell me about your hometown. Why do you enjoy (or not enjoy) living there? What makes it special? Does it have a claim to fame? Deadline for leaving comments for the giveaway is 11:30 pm EST, August 28th. I have several of her Virgin River books on my TBR pile. Do they have to be read in order? I also have THE WEDDING PARTY and RUNAWAY HEIRESS. I haven't read any of her books yet. I will start reading her books soon. They aren't my favorite themes but I do enjoy them. I do like it when couples get it right the second time around. I just read that Carolyn Brown has one out LONG, HOT TEXAS SUMMER. Friends to Lovers- This can be a tricky theme to get right. Are they settling? Is there chemistry? My hometown is Two Rivers, Wisconsin on the shore of Lake Michigan. It's very picturesque! You can bike, hike, swim, kayak, fish, camp, stay in a Frank Lloyd Wright designed home or visit the Rahr-West Museum and Flower Garden or tour a submarine in nearby Manitowoc. There's a car ferry service to Ludington, Michigan too. People take pride in their homes with lots of pretty flower gardens. People are friendly. I feel safe walking and biking after dark. It's 5 miles from Point Beach State Forest. 1) It's known as the "coolest spot in Wisconsin" as it sits on a peninsula surrounded on three sides by water. 2) It's the home of the first ice cream sundae. They even have a ice cream festival in the summer. 3) Growing up, over July 4th weekend, they had the Snow Festival featuring a parade with a dump truck full of snow that had been buried. 4) They have an annual Kite Flying Festival at Nashotah Beach every summer. Quite colorful and fun. I do recommend reading the Virgin River books in order. They can each be read as a stand-alone but the books build upon one another which will make the reading experience richer and more complete if read in order. I do enjoy second-chance stories. So many of us need second chances in real life, too! My favorite Robyn Carr book is The Chance, book 4 of the Thunder Point series. My hometown is a medium-sized city in Louisiana. One of its claims to fame would be the Mardi Gras celebration held there. My kids and grandkids love to go back for it! Robyn Carr's books are memorable and special. I have read The Wanderer from her Thunder Point Series which I enjoyed greatly. Second chance romance is always appealing and involves so much emotion that I love that topic. My hometown is charming, beautiful, historic, and was a wonderful place to grow up. Due to the harsh, lengthy winters it was time to move to an easier clime. It is known for the uniqueness of its appearance, the language, the cuisine and the appealing and special atmosphere. it has a Just for Laughs festival each year. "Memorable and special" are two very good words to describe Carr's books! I love Robyn Carr books and I have read The Homecoming.. I love visiting Thunder Point, but I have a soft spot in my heart for her Virgin River. Jack, Mel and all the residence of Virgin River. I feel like when I read her books I am with friends when I read any of her books. My hometown is a small city, that is home to the University of Guelph. It is small enough than the city I was born and raised in Toronto which is the largest city in Canada. Although I grew up in the metropolis, I moved here 12 yrs ago September 1st, and never regretted it for a minute. It is a city within the heart of the best farming in Ontario. I can visit many lovely little towns and villages and get my fill of the country side while being able to have all the things a city can offer. I can get the best of both worlds. 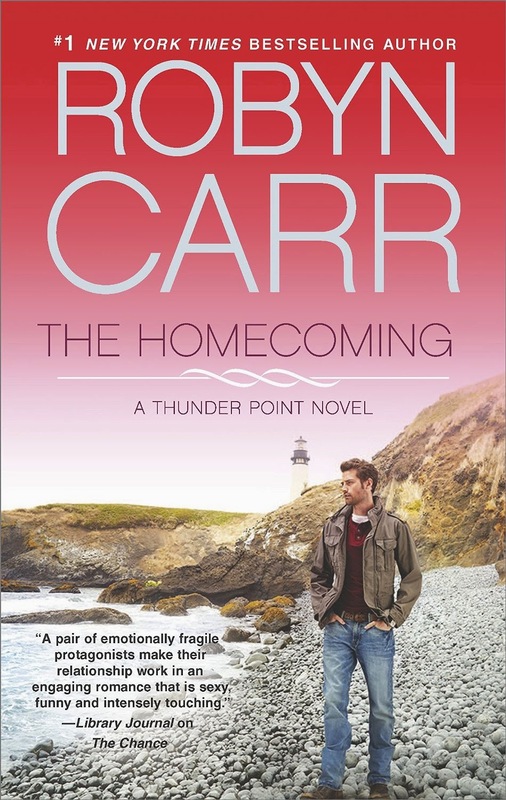 Like you, Kathleen, I love the Thunder Point books but Virgin River was my first Robyn Carr book and that series will always hold a special place in my reader's heart. I used to visit Guelph when I was a teenager! My cousins lived in Waterloo. Second Chance novels give me hope. Virgin River books were my ultimate escape. My hometown is an unusual and unique place to live since it doesn't resemble most American towns. It is historic and fascinating with a great climate, a world renowned balloon fiesta each fall and authentic. Sounds like you have a wonderful - and interesting - town! The House on Olive Street is my favorite Robyn Carr book. Oh, that's a good one, jcp! I loved her Virgin River books. I have only read one of her new series. I loved the Virgin River series and am loving Thunder Point. I started reading The Homecoming last night. There are a lot of laugh out loud quips by the characters and I am still getting over "the family tartan." I am enjoying watching Seth and Iris get to know each other once again. Since my husband and I married because of our taking a second chance, I am a sucker for second chance stories. My hometown is known for a burning river back in the 70s and as the birthplace of the term "rock and roll." I don't visit often as once I moved to Virginia, I found my real home. Happy your second chance worked out! Sounds like you have the best of everything, erin! Do check out the series. It's wonderful! My small hometown has an annual Round Barn Festival! It was nice to grow up there, but now that I've been away for so long, I've no intention of moving back. I am a big Robyn Carr fan. I own & have read all of the Virgin River books. I still like the first book, Virgin River, the best. Friends to lovers is my absolute favorite trope! I am still working my way through her series. They got packed away when we were working on the house and I haven't put them back out yet. I don't have a favorite yet. I enjoy both second chance and friends to lovers stories. I grew up outside a small town and currently live about 10 miles from one. Jonesborough, TN, where we now live, is the oldest town in the state and has been nicely preserved. It is home to the International Storytelling Center and hosts the National Story Telling Festival the first weekend every October. It was used as the town in the movie GOODBYE MISS 4th OF JULY. My favorite Robyn Carr series is the Virgin River series. Such a great place to visit in the stories. I do like second chance stories since they are usually emotional. Virgin River is the book that introduced me to Robyn Carr so it holds a special place with me but I'm really enjoying the Thunder Point books as well!